This is my second post today : ) Please see below for the Divine Divas Inspiration Challenge! Hello! I made this for this week's Mojo Monday sketch : ) I've had this sweet Sugar Nellie image for a while, but have never inked her up!!! I decided to pair her with some October Afternoon Farm Fresh dp, but I'm dying to make another one with some soft, springy colors! I will leave a full recipe below :) Thank you so much for stopping by...Again! This is sooo cute. Loved the coloring and the choice of patterned paper. Very pretty. That is precious! I think I need to have that stamp now! AWWW Kerri she is sooo adorable!!! LOVE that dp its just perfect and you rocked the mojo sketch!!! BEAUTIFUL card! Aww Kerri, this is super sweet! Love how you've used the distressed ink around her image. Oh this sweet little girl with the kraft and the vintage textbook paper from OA is just fantastic. Totally vintage in that sort of country farm kinda way - really sweet! 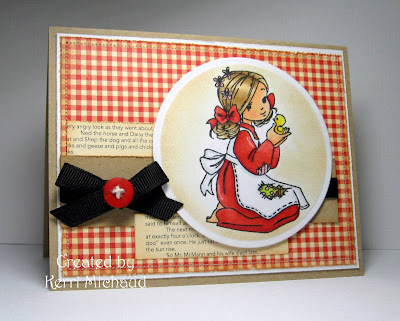 Very sweet Kerri...love that red-gingham bg paper, and that image is precious! You rocked this weeks Mojo and I absolutely LOVE your black ribbon here, perfect touch! So precious! Beautiful coloring and I like the simplicity of the design! Very pretty, Kerri! Love the country feel to this card. Beautiful stamp Kerr1! Love the paper you used too Very fresh. What a sweet and lovely card Kerri! I love the cute image. Oh I just love that image!! So sweet!! Your coloring rocks!! The gingham paper, colors and use of the sketch make for an awesome card, Kerri! Gorgeous! I love it with this paper. And your soft sponging on the image is fabulous. I love how it kind of reminds me of an old farm kitchen (in a good way, from the fun tablecloth type paper and colors). And I can't wait to see it when you switch it up with spring colors, too. What a precious card! I love this sweet little girl image! Your sponging is amazing, Kerri! And I really love the text papers you added! So sweet and cute! The gingham that you paired her with is perfect! beautiful job on this card!